The PedalBox is installed between the accelerator pedal sensor and the control module and works by capturing the accelerator pedal signal and transforming it. This is a fantastic option to enhance driving pleasure on normal aspirated and turbo vehicles, and does not affect the vehicle warrantee as it does not alter the engine in any way. Lots of manufacturers offer similar functions via standard “Sports/ECO buttons”. The PedalBox reduces the pedal travel necessary in order to reach a “throttle wide open” state (full throttle response). 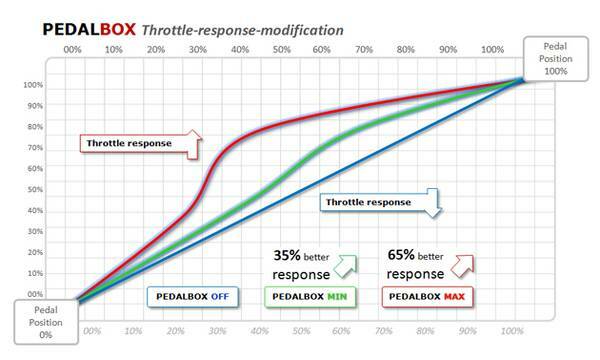 The PedalBox has four user-selectable programmes, that increases throttle response by removing delays in the accelerator, enhancing driveability. If driving style is adjusted, the PedalBox can even allow fuel consumption to be reduced. The four modes available are, SPORT mode, SPORT Plus mode, ECO mode and OFF. You’ll be impressed – If not, you’ll get your money back. The “Throttle Response” curve shows the speed at which an engine responds to the driver’s pressing of the accelerator. Deficiencies are evident here, especially at times of strong acceleration.